The mathematics of strangulation of Gaza | The Only Democracy? When the specifics of Israel’s siege of Gaza came to light, it appeared almost random in its insanity and cruelty. The famous example is the prohibiting of pasta while allowing rice, all the while claiming this was somehow ensuring Israel’s security. Well wonder no longer. Through the heroic efforts of Gisha, whose work we feature regularly here on The Only Democracy?, the actual policy has been released. It turns out there is a detailed series of charts and formulae that look like someone attempted to translate the lectures of Glenn Beck into public policy. In the driest of terms, it represents a calculus of human misery, equations of despair that add up to the starvation of Gazans and a protracted conflict. Here is Gisha’s summary of the revealed policy, with my annotations. So, the lower red line is to tell Israel that its policies were working as designed to cause shortages, thus allowing them to “ignore” the warnings. Even at the upper limit, Israel could keep denying goods if it saw fit to do so. I am reminded of one of those thermometers used to measure fundraising, only here the goal is deprivation not development. These are the source of the infamous regulations on pasta v. rice, and coriander. With a great perversion of cultural sensitivity, the things that Gazans like are to be taken into account and restricted accordingly. International community members, on the other hand, are still able to access their favorite goodies lest they become too vocal in their opposition because of personal inconvenience. Here is the truly Kafkaesque part, Palestinians were not to know what was on the list and what was not, allowing the Israel to act as a vengeful and obscure deity determining what they could eat and build with. Whenever Israel (or the U.S.) government cites “security” , we should substitute the word “embarrassing.” Try it, it works. Those international organizations may be able to buy their own personal consumer products, but they are not allowed to import goods for Gazans to rebuild after the war. I am reminded of the US-backed, Central American death squads who targetted anyone doing community development work, only in this case the death squads wear suits and sit t desks far away. See the photo below. But don’t allow the fancy graphs to obscure what is going on, which is calculating exactly how much suffering is being inflicted on the people of Gaza. Although these memos described the policies as of April 2009, we should not hold out too much hope that matters have improved. Richard Silverstein, who also posted the above photo, describes how this policy was actually supposed to be implemented. 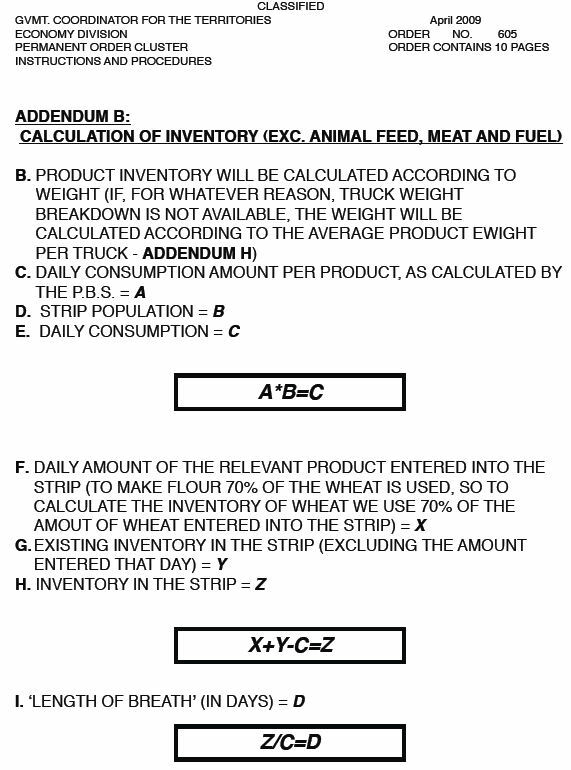 The data[on availability of items] will be collected in the economy division, once a week, on Tuesday, and a calculation compiled of products transferred, then added to existing inventories, and then consumed amounts will be deducted according to the models. 5. In case of shortage, the same actions as of ?lower level warning? will be taken. In case it is an intentional policy of reduction, decision makers will be presented with the consequences of shortage of the relevant product.